Italics on the original: References in "Eioioio"
In art, intertextuality is somewhat unavoidable. Sometimes it's just unintentional inspiration, other times we want the reader to know we're talking about some other work. We describe a certain situation in a certain way, or we simply throw a surname somewhere hoping the reader recognizes it. I try to avoid too much allusion to other writings, when I can, 'cause I don't want the reader to think they need to read something else to understand my stories. Eioioio, however, is a story born from intertext: it's openly based on the Eternauta comic book. Somehow that made me accept the referential nature of the game, and before I know it the thing was filled with references to other writers. I'm happy to discover, re-reading it, that they aren't just name-dropping. They always have, or seem to have, purpose. They're so hidden, people who doesn't get them won't ever feel stupid about it. But people who do see them will probably perceive… I dunno, some kind of expansion in the story's meaning through the texts that get mentioned. Something like that. 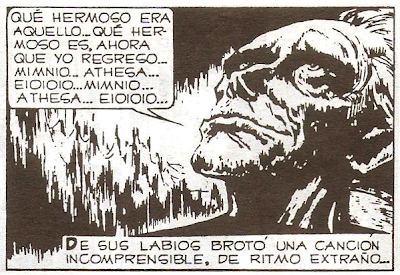 "How beautiful that was… How beautiful it is, now that I go back… Mimnio… Athesa… Eioioio… Mimnio… Athesa… Eioioio…"
Death, grief, the path to acceptance of death, all that appears in the title, part of the lullaby the Manos in El Eternauta use to bid farewell to life. And also in darker references, like the one to Juan Rulfo's La vida no es muy seria en sus cosas ("life isn't very serious with its stuff"). Rulfo's best short story, really, of all the great ones he wrote. During the dream, Karen's response to the idea of leaving the house I think I stole it from somewhere, possibly Orwell's 1984. Which isn't odd if we think El Eternauta is somehow a story about political repression in general, and the possibility or impossibility of offering any resistance to it. In the quotes from the Bible and the library-world map (directly imported from The Name of the Rose) is reflected the religiousness of Karen's father, that for some reason I found a feature worth stressing, of some relevance to the character. My favorite reference, of course, is the poem in the plaque at the library, near the game's beginning. 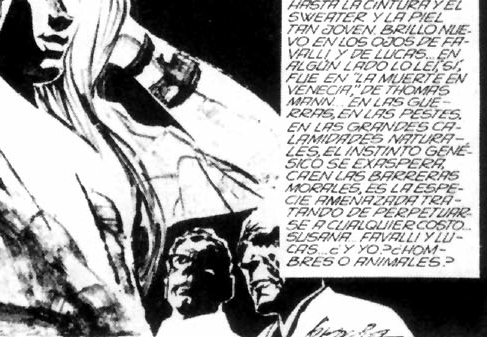 It's a fragment from my favorite book, if there's such a thing, Leopoldo Marechal's novel Adán Buenosayres. There's some stuff about that. First, Karen declares herself as a reader of short stories and novels while her father preferred poetry. Analogously, mi mother is an exceptional poet and while I'm a writer too, I only write prose. And Adán Buenosayres is one of my favorite prose narrations, but it's written by a person who defined himself as a poet. Also, the original fragment isn't actually in verse, I just divided it that way 'cause I felt a poem was more like something to put on a plaque. The "point where the rain ends" thing came from a game previous to Eioioio, that I never finished. For some reason I conserved the "rain" thing, although I could've used any other word. Maybe because rain and snowfall aren't so different images. I searched for "rain" in Adán Buenosayres ("lluvia" actually) and I found some results. The fragment I chose is the more poetic of'em all. I usually don't translate proper names into English. In Úrquel, the black dragon, for example, I left the protagonist's name like "Víctor," according to the Spanish orthography, instead of the English "Victor." In this poem's case, however, I felt that leaving Adán's name in Spanish for the English version was gonna make the biblical reference less clear. And the reference was important not only to Karen's father, but to Marechal as well. Should I worry about stuff like this? Is art bound to be always about previously done art? I don't know exactly where I'm trying to get. I was just surprised to have so much intentional intertext in a game this short, being that I tend to write in a very different way.